Learn more about RF Integration’s IC Design capabilities and what we can do for you? 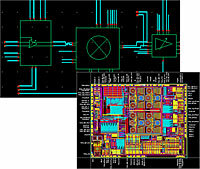 RF Integration offers a broad range of IC Design Services. With experience in RF CMOS and SiGe from 350 to 65nm, RF Integration can support your custom specifications or leverage our extensive range of background IP to support your needs. Designs range from individual building blocks such as LNAs, VCOs or mixers to complete Radio subsystems. RF Integration can also support GaAs, PHEMT or HBT designs up to 40GHz and beyond. Our strategic relationships with best in class foundry, packaging, test, distribution and EDA vendors combined with our extensive design expertise ensures the practical aspects of RF and microwave design are included. 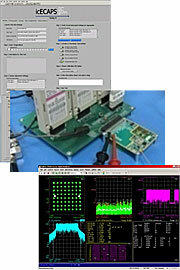 RF Integration uses a full suite of Cadence RFIC and SoC design tools. Spectre and SpectreRF support non-linear and linear simulations. Agilent’s Golden Gate simulator is used for nonlinear simulation with fast and accurate convergence. Virtuoso XL Layout Editors create the physical layout driven from the circuit schematic and link the schematic and layout to simplify the layout process. Assura Verification Tools perform Layout Versus Schematic (LVS) and Design Rule Checking. QRC Extraction extracts parasitics from the physical layout for final simulation and design validation.. For microwave and mm wave design, RF Integration use a full suite of ADS tools from Agilent. RF Integration can also support a full digital design and verification flow from Verilog Synthesis through place and route, Design Rule Checking, timing closure and Layout versus schematic. This parallel digital design capability allows integration of your proprietary digital IP, third party IP or custom logic design into a full mixed mode design. icECAPS is a sophisticated proprietary Universal Test Platform for RF and Analog circuits. Engineering test and validation of complex RFICs is non-trivial. For example, a transceiver with integrated gain control, band and mode selection and calibration loops could have many individual configurations. Added to this is the requirement to validate the design over process, voltage and temperature.